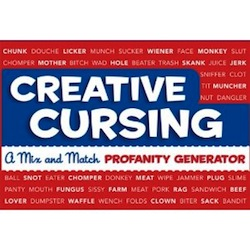 A Mix 'n' Match Profanity Generator. Whether you're annoyed with your neighbor, agitated with your boss, or tired of your lazy roommate, this unique side-by-side flippable flap novelty book of amusing and socially unacceptable phrases will provide endless possibilities for creative and colorful vocabulary. Both young and old students and professionals alike will appreciate this easy-to-use, uncensored, totally x-rated, and hilarious phrase generator. Unleash the immaturity and skewed sense of humor within and never be left searching for a clever comeback again.